Frank Spinelli's photographic passion focuses on human nature, and nature herself. Whether shooting mushrooms or people, each created image reflects a technical mastery that generated a diverse and successful career shooting fine art, editorial, and advertising assignments. His first fine art book, "The Glorious Mushroom", was published in 2007 by Catskill Press, and depicts intimate portraits of mushrooms. 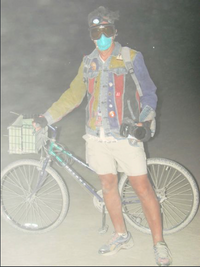 His second book, "Burning Man into a 21st Century Utopia", published in December 2014, combines his stunning vision of the famous festival within the context of American art-driven Utopianism. Other recent works are studio and street portraits revealing close-up encounters, including many with neighbors in his hometown of Woodstock, N.Y., as well as where his curiosity leads. His travel work captures moments of insight into the lives of people from around the world. Awards for commercial work include, Communication Arts Magazine, The Art Directors Club of N.Y. and N.J., as well as Art Direction Magazine. He has shot on assignment for N.Y. Magazine, The N.Y. Times magazine, and Fortune magazine. Advertising clients include IBM, Nikon, Gorham, P&G, DeBeers, and Braun. He has lectured about photography at F.I.T, Parsons, and the MId-Hudson Valley Mycological Society. His next book is entitled, "The Passionate Mushroom".